I won’t go into the rest, but think about it right now. In Exodus, the Israelites were being guided by God out of Egypt. I have been through the long Suez canal (which did not exist back a couple of millenia BC). 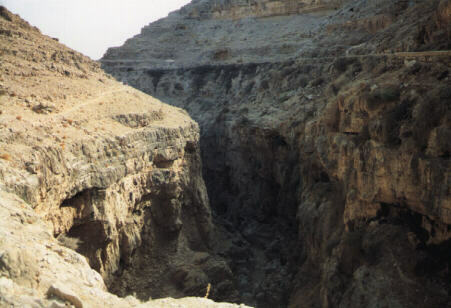 If God wanted to get the people of Israel safely into the Sinai Peninsula, and greater Asia, it would not have been hard to give them a “dry ground” path. Yet they were led into a trap… by God. Why did God lead them into a trap? One might argue that it was strategic to destroying the Egyptian army… but of course, this could have been done in many ways, including many ways that would not have terrorized the people of Israel. Clearly, God put them into a trap so that He could demonstrate His power, and even more so His faithfulness, to bring them out and through. Now, most of us may have problems with being “terrorized.” I get that. But we also need it at times. My wife and I, among other things, do pastoral care, including missionary member care. We have dealt with missionaries struggling with support or personal conflicts. We have have had personal struggles and personnel struggles, but our finances had not really been a problem. But a few months ago, our support reduced drastically, and will again in just a few months. We have been forced to trust God. We have had quite unexpected support coming in that has been a big help so far. We still have reasons for concern for the future, but we have a better perspective on God’s faithfulness when we see it through the lens of adversity rather than through the lens of prosperity. Psalm 23 notes that although we walk through the Valley of the Shadow of Death, we can fear no evil because God is with us. But sometimes we need God to lead us into those that shadows of death, the valleys in our life, to truly understand that God is with us. I just recently did a short talk on Folk Islam. Not the center of my expertise, but our regular speaker was not able to make it. So I tried to position the talk from an area of greater strength for me… anthropological reflection. So I showed the classic cultural triangle. “Western” Cultures are more interested in Guilt/Forgiveness. “Eastern Cultures are more focused on Shame/Honor, while (so-called) tribal cultures emphasize fear and power. The orange region tends to be the cultural setting of most Christians, while the green region tends to be the cultural setting of many, but not necessarily all, of other “great religions.” This arguably includes Islam. The Broader culture. An adherent to a religion in a broader culture that is, for example, honor-shame focused would tend to share that focus. Religious Denomination. Denominations tend to needs in a specific region or range on the triangle. For example, I was raised Fundamentalist Christian. There is a strong proclivity toward Guilt and Forgiveness. 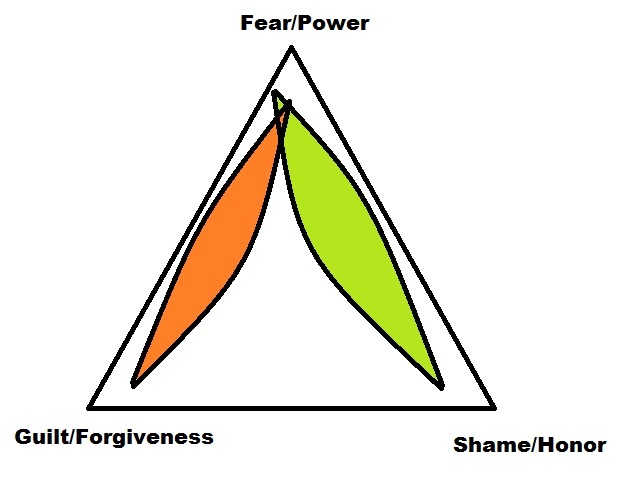 Charismatic groups are more like the half-way point between Guilt/Forgiveness and Fear/Power. Religious Class. Religions have Formal Religion and Folk Religion. Formal Religion tends to have “religious thinking”— with the adherence to formal doctrines and having the goal of serving spiritual powers. Folk Religion is more emotional rather than doctrinal, and tends towards “magical thinking”— seeking to manipulate (rather than be manipulated by) the spirit work. Folk Religion tends more toward the Fear/Power side of things while Formal Religion (at least of major, non-primal, religions) is away from that vertex of the triangle. Since the vast majority of most religions are more folk practitioners than formal practitioners, one has to deal with the fear/power side of things more. I noted that for Folk Islam, Charismatics, and probably to a lesser extent Pentecostals, have an advantage over Conservative Evangelicals because their cultural center is closer on the cultural triangle. Reduce cultural distance. Enculturation comes through interacting in and seeking to understand the behavioral and cognitive patterns of a culture. Removing distance culturally does not undo one’s beliefs, but it may broaden them. After all, Jesus was not only an atoning sacrifice, but was also a liberator, and bestower of honor. Understand what the people are most concerned about. They may not be most interested in Heaven. They may not be most interested in forgiveness. They may be most interested in family, community, health, and prosperity. One doesn’t necessarily have to redesign Christian doctrine to these different priorities, but it should speak prophetically to these concerns. Be open to the possibility that God will demonstrate Himself through power. I have little time for those who feel that God constantly does demonstrate Himself through power. It tends to lessen focus on God’s more common method of working through the weak, the foolish, and the vulnerable. It also puts pressure on people to “fake it,” label as from God what was not from God. However, God has power, and it seems like, especially in situations where the Gospel message is first entering a community, God will demonstrate power as a sign. Focus on symbols and rituals. Power is often seen in amulets, talismans, incantations, and various rituals. I don’t recommend totally embracing this worldview (wiping handkerchiefs on a religious icon, or getting them “blessed” by a televangelist) adding to local beliefs on contagious magic. But one can’t simply throw away these things and assume that there is not a vaccuum that will be filled by something else. Consider rituals. Rituals are tied to lifecycle, to crises, and to the calendar. In each case, they provide comfort in the providence of God (or god, or gods) that the future is secure. Rituals and symbols can and should be used to provide comfort, while helping them understand that true faith is more relational than magical. Power Encounter. The interaction of the power of God with the powers (whether spiritual, natural, or human) within a people. Allegiance Encounter. The interaction of the call of God with the prioritizations/allegiances within a people. Cultural Encounter. The interaction of the Biblical perspective and behavioral patterns with the culture of a people. Love Encounter. The interaction of the Love of God with the selfish valuations within a people. What should be done first? Love Encounter should always be first, I believe. To encounter a community demonstrating God’s love is always foundational. In folk religion, faith is more emotional than cognitive, so love encounter is even more critical. But what is next? For some cultures it might be truth encounter… but for Folk Religionists, power encounter tied to cultural encounter hand-in-hand probably comes next. After all, folk religionists commonly are linked to their faith through their culture and their priority of power to overcome fear. Next would be truth encounter. After a foundation of God’s love, and the bridges of God’s demonstrated concern and power translated through culture, God’s message must be made clear in the language, thought patterns, and priorities, of the people.. Ultimately, there must be a change of allegiance. They must choose to follow Christ or the old way. Of course, following Christ does not destroy all aspects of the old way, nor, on the other hand, should it syncretize it. It should transform and fulfill it. An interesting thing to note is that the five encounters start and end with emotions. It starts with dealing with love and fear and ends with dealing with trust. The other two are more cognitive, truth and culture… dealing with symbols and meanings. None of the five are, strictly speaking, addressing behavior directly. Behavior is the natural fruit of spiritual transformation. Spirituality is the intersection of power and meaning (ideas and values). If behavior does not change, one must question the spiritual transformation. Some theologies don’t fit into this schema very well. Contextual theologies (Black, Dalit, Liberation, Feminist, Minjung, Post-colonial, etc.) don’t fit into these very well. Of course, it could be argued that all theologies are ultimately contextual, but that can be dealt with on a different occasion. Additionally, there is Pastoral Theology, which is focused more anthropologically and more tied to action reflection. 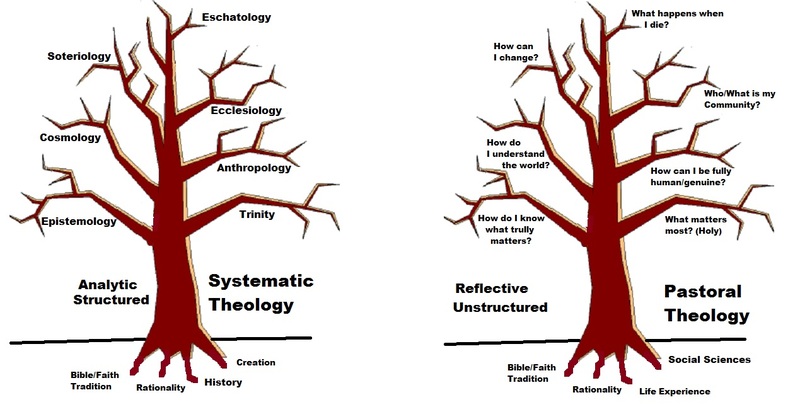 Of course, since pastoral care is based more on action/reflection and is normally unstructured, the structure based on the tree and systematic theology is of practical value not formal analysis. So where does Missions Theology fit in. Originally, I was told that Missions Theology is a Practical Theology. It draws from Systematic Theology and guides action. That makes sense. However, in practice, missions theology rarely does draw from the insights of systematic theology. Perhaps it should… but since it normally doesn’t, perhaps we should look elsewhere. It could be a part of Systematic Theology. It could be a sub-category of Systematic Theology like soteriology, eschatology, ecclesiology and so forth. The problems with this are two-fold. First, missions theology rarely draws very heavily from Biblical, Historical, and Philosophical Theologies… Missions Theology certainly might gain from these theologies, but it just tend to happen that much. Second, missions theology tends to be too practical, while systematic theology categories tend to be more academic. If one looks at missions as it is practiced, one might argue that it is commonly guided by “pragmatic theology.” This is not a category of theology, but more a category of “non-theology.” There is a tendency to base missions on the guiding principle of “If it seems to work, do it.” That may be what is done, but I am not comfortable resting here. One might argue that Missions Theology is a Contextual theology… after all, missions theology is greatly concerned with theology as it pertains to specific contexts. Additionally, missions theology could be thought of theology as it pertains to the context of missions. However, contextual theology is generally defined differently, more to people groups and to group perspectives, not to activities that may ultimately be supracultural. I would argue that Missions Theology should best be seen as related to Pastoral Theology. Pastoral Theology is non-systematic, and missions theology tends to have a fluid quality to it. It tends to defy a strict systematization. Pastoral theology is religiously humanistic, understanding the person within the context of God’s overall work. Missions theology is similar— focusing on persons and people within the context of God’s overall mission. Pastoral theology is tied to practical ministry as is missions theology. Finally, pastoral theology is based on action/reflection— and this seems to be the best way for missions theology to develop. Does this matter? I believe so… the categorization of missions theology guides how it develops and how it is used. I believe that action/reflection makes it practical while still being truly theological and ethical. Many believe that there is a universal Christian theology… or a theological interpretation of the Bible that is unaffected by culture. Western theology (I am here thinking of Reformed Theology, but other Western Theologies can apply as well) typically seems to be viewed as a supra-cultural theology. Those who embrace Reformed Theology tend to think of “Contextual Theology” as the theological view of some other groups, but don’t see their own theology as contextual (particularly in terms of culture). I read an article before suggesting that Pentecostal Theology (although the theology described seemed to be more in line with Charismatic Theology than classic Pentecostal) could be a universal (read supra-cultural) theology. The problem is that each theology seeks to meet a need that is contextual. That also means that each theology has the tendency to “itch where it does not scratch” for certain people. Guilt-focused cultures struggle with the issue of judgment and forgiveness. For them, Reformed Theology addresses that issue. For Fear-focused cultures, helplessness and power are of prime concern and Charismatic Theology addresses that. To be honest, guilt and power have never really resonated with me. For me, I am concerned probably most with the issues of alienation and community. This, I suppose, puts me into the category of many of the post-moderns, as well as more traditional shame-based societies. Sadly, the theological structures for alienation and community are not established to the same level that Reformed and Charismatic theologies have been. Hopefully that will change since neither of these existing theological structures appear to be well-placed to meet the needs of a growing segment of the world population. Of course, a charge could be made that the Bible has one interpretation and lends itself to only one theology (orthodoxy). Any other theology is, by definition, heterodoxy. Conversely, there is a counter view that relativizes all theologies into a sort of theological pragmatism… if it works (in the culture) it is good theology. The passage suggests two opposite things simultaneously. The message of God will challenge cultures. The message is a stumblingblock to Jews who are seeking powerful signs, and foolishnesss to Greeks seeking divine wisdom. On the other hand in Christ, Jews experience the power of God and Greeks experience the wisdom of God. God’s working is contextual and meets contextual needs. If God’s message is supra-cultural but applied contextually, any theology that addresses a specific (cultural) context may meet that contextual need, but also challenge that specific context. For those who feel guilt and seek forgiveness, God’s mercy provides hope of ultimate forgiveness. That forgiveness is not based on what we do. Yet God’s message also challenges because it rejects an intellectualized faith but calls for a working faith, and following Christ calls us to a radical responsibility to serve. For those who feel fear and seek power, God’s power provides hope and ultimate freedom. Such power is not based on our own strength but God’s. Yet God’s message also challenges because His power is perfected in weakness, and following Christ calls for us to a radical readiness to suffer. What about for shame-focused cultures and for post-moderns? Not sure, but something like this. For those who feel alienated and seek communiion in God, God’s love provides hope of ultimate reconciliation and community. That reconciliation with God and others overcomes our own tendency to self-alienate, Yet God’s message also challenges because this reconciliation is often perfected in loneliness, often pitting brother against brother and sister against sister. In other words, contextual theology is not about “telling people what they want to hear.” Rather it is addressing God’s message to the needs and concerns of a specific context. God’s message, if it is accurately contextualized, should both comfort and challenge the hearer. God is always faithful. I think it could be said to be true. Perhaps one could say, “God in relation to His children, commits Himself fully to that relationship.” That is a comforting thought. God never fails. This one is ambiguous because it is not clear the perspective. If one says, “God never fails in that which He purposes to succeed in” I suppose it could be said to be true. If one is taking the human perspective regarding what constitutes failure, one could argue that God fails all the time. We often want God to do something and then God fails to do it. He never disappoints. The wording suggests a personal perspective so it seems safe to say that this is undeniably false. God often disappoints, thankfully. It is not bad that God fails and disappoints from our perspective. Why? It shows we care. The only way God never fails or disappoints is if one sets one’s standards regarding God so low that this is not a possibility. Perhaps an atheist or a practical atheist (one who believes in God but for whom God has no practical relevance) cannot be disappointed by God. But those of us for whom God is relevant, disappointment should happen… a lot. We need a relationship with our Creator, not a magic lamp that grants us our every wish. We don’t do well as human beings when our every desire is met. A parent who does not disappoint his child at times is likely to produce an extremely spoiled kid. We grow through learning what we need, and what simply feeds our greed. They can produce good things in us. A lot of the Psalms were written by composers who saw God as failing them. These laments were the result… a cry out to God and a return to praise. Read Psalm 44 sometime. Of course, some can find disappointment or see failure on the part of God and reject God. But that is part of the problem of people repeating catechistic “happy” statements that are not true. These statements don’t prepare people for the reality of relationship. It is like telling newlyweds, “Real love lasts forever,” or drawing from a Tanya Tucker song, “If it don’t come easy, you better let it go.” Well, real love CAN last forever, but if it is not nurtured, it will die, and nothing truly worthwhile is all that easy. If one tells people that God never disappoints, and then someone is disappointed by God, how will that person handle it? Philip Yancey has earned a considerable amount of money (I assume) in writing about God in real terms, including his book, “Disappointment With God.” Frankly, he is simply saying what we know… but try to block out of our minds… as if a relationship with God is more real if it is based on falsity. But people shouldn’t have to go to one writer to explain the reality of divine relationship. We all should help people grow in their relationship with God. If we do, we are in good company. 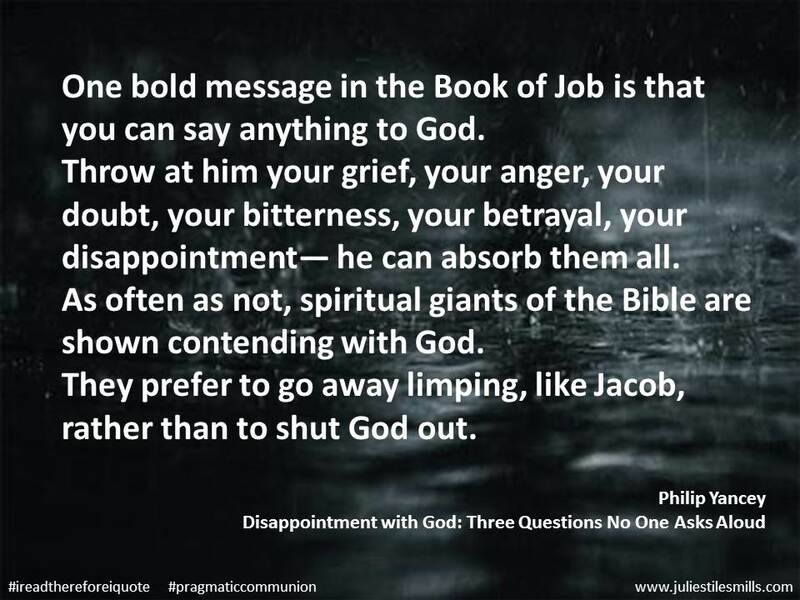 Job, Habakkuk, the Psalmists, and the author of Ecclesiastes all willingly dealt with these issues, willing to recognize that God does disappoint. Even Jesus, on the cross, expressed disappointment with the Father, “Why hast Thou forsaken Me?” I know some would say that Jesus was just fulfilling Scripture… but if the Scripture was indeed prophetic, then it was prophetic of His disappointment, I believe, with the Father. Missions is about bringing people to God… helping them grow in a real relationship with God. We help them when we help them understand the God who is, not the God of happy-sounding mantras.